Director Emilio Estevez's emotional drama will be heading to Blu-ray in February. 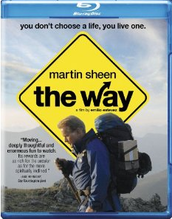 In an early announcement to retailers, Arc Entertainment has revealed 'The Way' is coming to Blu-ray on February 21. 'The Way' is a powerful and inspirational story about family, friends, and the challenges we face while navigating this ever-changing and complicated world. Martin Sheen plays Tom, who comes to St. Jean Pied de Port, France to collect the remains of his adult son, killed in the Pyrenees in a storm while walking the Camino de Santiago,. Rather than return home, Tom decides to embark on the historical pilgrimage to honor his son's desire to finish the journey. What Tom doesn't plan on is the profound impact the journey will have on him. From the unexpected and, oftentimes, amusing experiences along 'The Way,' Tom begins to learn what it means to be a citizen of the world again. Through his unresolved relationship with his son, he discovers the difference between "the life we live and the life we choose." Specs and supplements have yet to be revealed, but suggested list price for the Blu-ray is $32.99. You can find the latest specs for 'The Way' linked from our Blu-ray Release Schedule, where it's indexed under February 21.